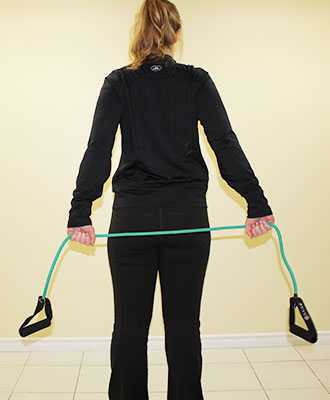 Using a Thera-Band or elastic tubing wrapped around a doorknob or in a closed door at approximately elbow-height, hold each end of the tubing and stand at a distance that the tubing is straight with a bit of tension. 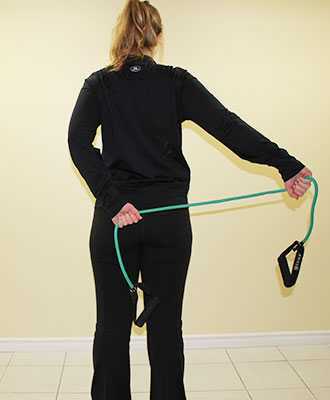 If this exercise is too hard with the resistance of the tubing, simply do not use the tubing and just work on drawing your shoulder blades back together. Lie back on a flat surface. Have your arm extended at shoulder height, with your elbow bent at 90 degrees to point up to the ceiling. Slowly rotate your arm around your elbow in the arc displayed in the picture, so that the palm of your hand touches the surface in one direction, and the back of your hand contacts the surface in the other direction. Stop the motion if you experience pain. Repeat 12-15 times. 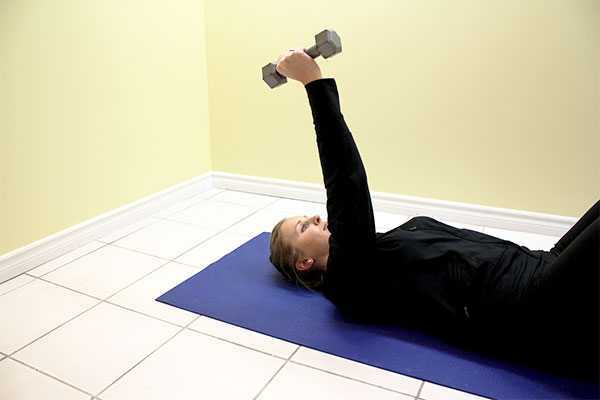 If this exercise is too easy, try holding a 2-3 lb weight. Stand up straight with knees slightly bent, holding 2 soup cans or light (3lb) weights. Bend one elbow to bring the weight up towards your chest, while keeping your elbow close to your side body. Slowly lower back to start, and repeat on other side. Perform 10-15 repetitions per side. Lay back on a flat surface, with hands extended above you holding a soup can or light weight in one hand. Without moving your shoulders, bend just your elbow to a 90 degree angle, to lower the weight by your head. Straighten elbow to return to start. 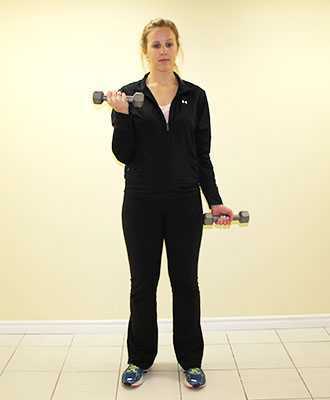 Modification: You can hold the weight with 2 hands if it is too hard to perform the exercise with one hand only. Stand with the shoulder that is injured facing a wall. 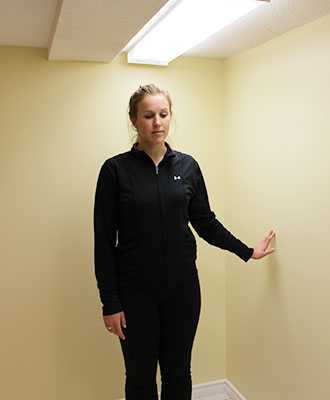 Slowly walk your fingers up the wall until your palm is flat against the wall and your arms are straight. Return to start. Repeat 5 times. Gently pull one arm across your chest, holding the upper arm. You should feel the stretch in the back of the shoulder. Hold a stick or rolled up towel behind you, holding it lightly with your left hand. Using your right hand, gently pull the stick/towel horizontally to the right, feeling a stretch in the front of the left shoulder. Hold for 30 seconds before repeating on the other side.